Most people are surprised to learn that OWA Beer, with bold Japanese Kanji characters emblazoned across its washi-like bottle labels, is actually Belgian in origin. Brewer and owner of OWA Beer, Leo Imai, originally a Yokohama native, now plies his trade from Aalst, about 19 miles northwest from Belgium’s capital of Brussels. 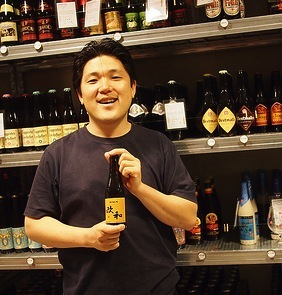 How did a brewer of Japanese origin end up making beer in Belgium of all places? His story is perhaps a familiar story of following’s one own passion. The 39-year old was previously working for one of Japan’s largest beer manufacturers, Kirin, albeit in a totally different capacity – he was in its restaurant section. He held the belief that consumers would be keen to know who made the beers they were drinking and the philosophy that went behind them. That sparked a journey to Europe, with stints in Ireland, Germany and Belgium to learn how to make beer. His background in chemistry helped. While working for a Belgian brewery, he found out that they had excess capacity and asked if he could make his own beer. OWA Beer was thus born. His signature OWA is a Belgian-style pale ale, while the other key beer is its darker cousin, the OWA Kuro, a strong dark ale. Both beers have been made for pairing with Japanese food. “I use roasted malts, and its taste pairs well with grilled food such as Japanese kushiyaki, as well as with the vinegared taste in sushi,” explains Imai. Today, OWA Beer works pretty much like a gypsy brewer, moving between breweries with spare capacity. “It can be challenging to use different equipment, but so far it is manageable,” he says. He currently makes around 600 hectolitres of beer a year, 90 to 95-percent of which is his signature OWA. Much of that production goes to markets in Europe – the United Kingdom is currently his biggest market – with 30-percent going back to Japan. Any particular reason why the UK is his biggest market? Imai has started to also make lambic (sour) beers, but applies Japanese flavors for his own interpretation of the classic Belgian sour beer style. His ume (Japanese plum) lambic recently made waves in a beer tasting event in New York, but he’s also looking to use Japanese yuzu as well as leaves from the cherry blossom tree. Making beers with a Japanese influence would be a hat-tip of sorts to his country of origin which he left in 2005. It would also pay tribute to the name OWA, the name of his brewery, with literally means “Europe and Japan”.